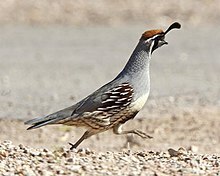 The Gambel's quail (Callipepla gambelii) is a small ground-dwelling bird in the New World quail family. It inhabits the desert regions of Arizona, California, Colorado, New Mexico, Nevada, Utah, Texas, and Sonora; also New Mexico-border Chihuahua and the Colorado River region of Baja California. The Gambel's quail is named in honor of William Gambel, a 19th-century naturalist and explorer of the Southwestern United States. The species is not as widely introduced as the related California quail. It was however released on San Clemente Island in 1912 by Charles T. Howland et al., where it is currently still established. The Callipepla gambelii birds are easily recognized by their top knots and scaly plumage on their undersides. Gambel's quail have bluish-gray plumage on much of their bodies, and males have copper feathers on the top of their heads, black faces, and white stripes above their eyes. The bird's average length is 11 in (28 cm) with a wingspan of 14–16 in (36–41 cm). These birds have relatively short, rounded wings and long, featherless legs. Its diet consists primarily of plant matter and seeds. C. g. gambelii (Gambel, 1843) – nominate – Utah and Nevada through Mojave Desert to Colorado, northeastern Baja California and Tiburón Island. ^ BirdLife International (2010). "Callipepla gambelii". IUCN Red List of Threatened Species. Version 2013.2. International Union for Conservation of Nature. Retrieved 19 March 2019. ^ Zink & Blackwell 1998. ^ "Callipepla gambelii". Integrated Taxonomic Information System. Retrieved 9 February 2006. Huey, Laurence M. (1932). "Some Light on the Introduction of Gambel Quail on San Clemente Island, California" (PDF). Condor. Cooper Ornithological Society. 34 (1): 46. doi:10.2307/1363791. Thomson, Matthew (2001). "Callipepla gambelii Gambel's quail". Animal Diversity Web. University of Michigan Museum of Zoology. Archived from the original on 2016-03-05. Retrieved 10 June 2016. Zink, Robert M.; Blackwell, Rachelle C. (1998). "Molecular systematics of the Scaled Quail complex (genus Callipepla)" (PDF). Auk. 115 (2): 394–403. doi:10.2307/4089198. Wikimedia Commons has media related to Gambel's Quail. "Gambel's Quail media". Internet Bird Collection.